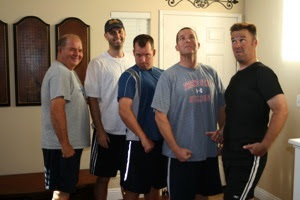 So every year the guys, with promptings from our wives, decide its time to shed a few pounds. We call it the fat mans club. The basic rules of the club are that you have to loose one pound a week on weekly weigh in. Everyone weighs in together and if you do not make weight, you pay $10.00 each week. You also have to be wearing some item of clothing, a rule which Matt was in frequent violation. You also have to exercise at least three times a week or pay the same fine. We also set a goal date that we want to make our final goal weight by and if that final weight is not made, you pay $100.00. With weekly weigh ins, it can get quite expensive if you don't stick to the plan. Of course the biggest incentive comes not from the money, rather the weekly weigh in and the fear of not making weight in front of the rest of the guys. This time around I lost around 23 pounds, making my weight goal by mere ounces. There was a lot of work to make those last few ounces. Fasting, running, spitting, exlax, - all have there place when trying to loose weight in a hurry. But because I made my weight, I was able to split the pot with the other four guys who were also able to do it. This years pot got to $330.00! My take you ask? $82.00. Now there are many things that a guy could do with $80.00 after starving himself for a week and exercising non stop to make weight. You could purchase some new work out shorts since the old ones are too big. You could go and buy some new ultra tight fitting shirts to show off your impressive build. Both were tempting. But for Robb, Matt and I there really was never any question. We did what any true man would do- load up the family and head to Hometown Buffet. Nothing like washing down Ex-lax with a little Hometown Buffet! So we have finally begun blogging if you want to check us out!! Robb looks a little bit like a "chick" in this shot. Maybe it is the way he is standing. His shirt was uncommonly tight. Obviously he wanted to show off the goods.